(11 May - Cropchoice News) -- Hailing from Embarrass, Minnesota, American Growers Foods is a farmer-driven food company with attitude. In a market that sometimes seems polarized between industrial agriculture and organics, the company's 6000 farmers go for middle ground: health conscious consumers interested in family farms and sustainably grown - but not necessarily organic - GMO-free foods. 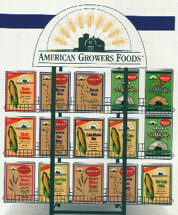 American Growers sells its own brands of corn, oat, and wheat products - breakfast cereal, corn meal, popcorn, muffin mix, tortilla chips, and grits. The company uses family farming as a selling point, and says American Growers is "more concerned with the people producing the crops used in its products than inflated profits -- more interested in the families consuming its products than corporate takeovers and acquisitions." Labels proclaim products as GMO and chemical-free. This fall, American Growers plans to move into edible beans. CEO Bill Lashmet says he's actively recruiting. The 6,000 farmers currently working with American Growers have been through a 4 year input-reduction program in which they have not planted GMOs. Lashmet predicts American Growers ranks will swell to 10,000 in two years. Strongest in the midwest, at an average of 1500 ac., American Growers have up to 9 million acres. American Growers aren't organic - they use chemical inputs; but by nurturing soil structure can apply at much lower rates than labels and most consultants recommend. This saves money and, after testing, enables American Growers to label its products chemical-free according to EPA standards. Lashmet says fighting for space on supermarket shelves has been tough: "it's been an uphill struggle; but now we're starting to break into national chains." American Growers products are on the shelves at Trader Joe's markets (a 130 store chain in 11 states owned by international player Aldi) and Henry's Marketplaces, a California chain owned by Wild Oats Markets, a Colorado-based natural foods chain. Lashmet says American Growers is also looking international. He's working on a deal with a Japanese food maker that buys 200 tons of ground corn a month: "They make corn sticks, sort of the Japanese equivalent of tortilla chips. They sent us a sample of ground corn and want to see if we can match it, because they're having a problem with Bt corn from other sources."